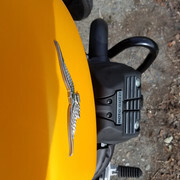 To install the givi engine guards, it looks like I need to remove the bolts that link the upper and lower part of the frame. Besides only doing one side at a time, anything else to consider? Never installed engine guards before. Looks straightforward but removing the frame bolts did give me pause. The shop said it doesn't need locktite and there's no torque spec. Well, some blue loctite wouldn't hurt anything... It's a fairly large diameter screw for a narrow flange, so it could potentially loosen. The general recommendation/ standard for self-locking screw design is that the flange diameter is ~5x as tick as the screw diameter, which isn't true in this case (but e.g. very true for cylinder head studs). Thanks to you both. Blue loctite it is. I put a floor jack under the engine with just enough pressure to keep it from moving when I installed the MG engine guard. Not a bad idea. I don't think I have my hydraulic floor jack any more but even a scissor jack with a hefty and wide piece of wood would work. Out of curiosity: have you seen them/heard about them moving or simply a precaution? Were the bolts reasonably easy to remove or a pain in the patoot? I did get a set of hex bits for my 3/8" ratchet. Thought that would be better than trying to wrestle a regular hex key. Even if it wasn't necessary, it was still a good excuse. I've done this both times I've installed sliders on our V7s. The first time I used a jack to support it and worked on one side at a time. Just last week I did it on the V7D and was able (because of the slider design) only remove one bolt at a time so I didn't even use a jack. I imagine you could remove a bolt and temporarily put a small pin or stud through the frame holes to keep them from possibly moving. Yes a hex bit (instead of a hex wrench) is handy. The nuts on the back seem to be captured from turning by the frame, but I still put a backup wrench on them when tightening just to be sure. There is always a risk of moving. 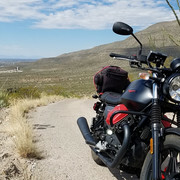 On many of my bikes the aftermarket engine guards would use engine mounts and some guys would get themselves into trouble. Better safe than sorry. Of course, like Kev said, still do one side at a time. I did one side at a time on my 2105 V7. No issues-did not even need a jack. I ground up a short podger to line the first hole up and put the bolts semi snugly in. then use the jack/engine hoist/levers to line up the second. Better to have it there and not need it, than to find out you needed it and didn't have it there. Kev, which engine guards do you use? I used sliders on both my V7s. Over Racing for the Stone and Sato Racing for the Dark. Looking good, I’ll check them out. 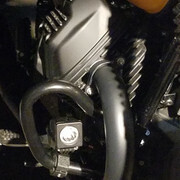 I find extra lighting important, which is why I installed the Guzzi engine guards. 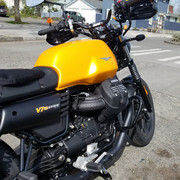 Engine guards are finally installed. Very anticlimactic. I did end up using a jack as insurance but now that I've done it once, I think it would have been fine without. I did one side at a time. The Guzzi and the Givi bolts/nuts were different sizes. Not a problem, just a note. The hex bits were REALLY handy but they hadn't torqued the heck out of the bolts so they weren't hard to get off. Congrats. Different sizes? Or different lengths? Different sizes meaning I needed a different hex bit for the bolt head and wrench for the nut. I think the length was the same or near to it. I also wanted to say: Thank You to everyone who had suggestions and shared their experience. How much do lights like that pull? I like the placement; it must really light up the road. My lights are LED and don't pull much. Of course you can shut them off when using your heat. Mine are for conspicuity during the daytime. Need all the help we can get making sure drivers see us.